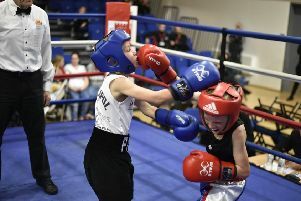 Peterborough Police Amateur Boxing Club picked up a couple of cracking wins at a Saturday night show in Nottingham. They had four fighters in action at the Aldercar & Langley Mill ABC show and Kacper Kozak and Jelisej Zaicev were very impressive points winners. Kozak (15) from Orton fought an older and much more experienced opponent in E. Morledge from the host club but won the 66kg bout easily on points. He dominated the centre of the ring with fantastic combinations against a really classy, switch hitter. His coach Chris Baker said: “This was a step up in level for Kacper and a very impressive win. I really believe in Kacper, he just needs to know this himself. Zaicev (20) from Peterborough made his ring debut. He had L. Cassidy from Ripley ABC on the back foot throughout his 67kg contest and won on a unanimous points decision. Baker said: “I can’t believe how well he dominated the fight and how he really tried to work out his opponent. “There were no wasted punches and he really concentrated on his boxing. Connor Dane (14) 57kg from Newborough took on local lad Archie Durham from Buxton ABC at 57kg and found him a shade too strong. Dane lost on points but battled away gamely until the final bell. Danny Meins (32) from Dogsthorpe lost to J. Greig from The Prospects ABC on points. All the Peterborough Police ABC boxers will be performing at the club’s annual show at The Queen Catherine Academy, Walton, on Saturday December 16. Contact Chris for tickets on 07921095122.